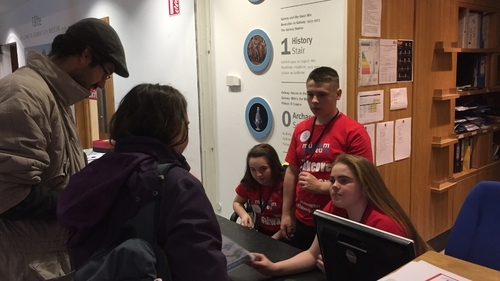 A group of young Travellers from Galway have taken over the City Museum, as part of an initiative to make the facility more accessible to young people. They are running the museum by welcoming visitors, giving guided tours and showcasing aspects of their culture. The idea is to give the children meaningful roles to participate in the day to day life of the museum. The teenagers, who are involved with Ballybane Foróige and the Westside Youth Project, each selected a particular item or topic being exhibited before today's takeover. They then studied all aspects of their chosen display and are informing visitors about the background and history of the items in question. They have also selected particular items that are meaningful to Traveller culture. These are being displayed at the entrance of the building, where visitors are encouraged to find out more about the traditions and history of the Travelling community. One of the participants, PJ Mongan, said he was delighted to get the opportunity to work in the museum for the day. He has a store of stories and anecdotes about the maritime history of Galway, which he has been regaling visitors with throughout the afternoon. Galway Traveller Movement has commended the museum for the initiative, saying it was a vital way of enabling cultural expression and embracing diversity.